Naoshima Island, also known as The Art Island, is on the South West of Japan's main island. What was once a sleepy industry village (with a large manufacturing plant) has transitioned into a hot spot for art loving tourists. Benesse House museum was the first to open in 1992, closely followed by Chichu museum and Lee Ufan museum. In addition, a number of unused local homes have been converted into art exhibits of their own, collectively known as The Art House Project. It's a long way away from Tokyo, but it's not as tricky as it seems to get there. Don't go on a Monday. Everything (and I mean everything) is closed. Except maybe Benesse House. Hire a bicycle. An electric one is probably best, it is hilly! Buy tickets to the museums in advance. They do sell out. It might seem like a bit of a hike, but the train system is very efficient. There is a direct train from here but it departs infrequently. It makes sense to jump on the local line to Chayamachi, then transfer (literally off one train and into another across the platform) to the Uno train. It is very easy. Finally, follow the obvious signage to the ferry terminal and book your passage across. It only costs 280 yen, and leaves approximately every hour. It's a pretty small island (well, the public part, not owned by the Mitsubishi Plant, is), you can circumnavigate it on foot in only 2 hours or so. Aside from walking, there are two main methods of transport. The bus: Easy and frequent, departing from the major ports, going through the two main village areas and stopping at all the major museums. It only costs 100 yen per person to ride... but make sure you have the exact change. You pay the driver when you get off. Bikes: There are a few bike hire places in the main villages of Miyanoura and Honmura. Choose between fixed gear, multi speed (about 500 yen), or electric bike (about 2000 yen). I'd recommend springing the extra yen for the electric, as it is quite hilly. Having said that, we went for a normal geared bike and we survived. Art and architecture, with maybe a bath thrown in. 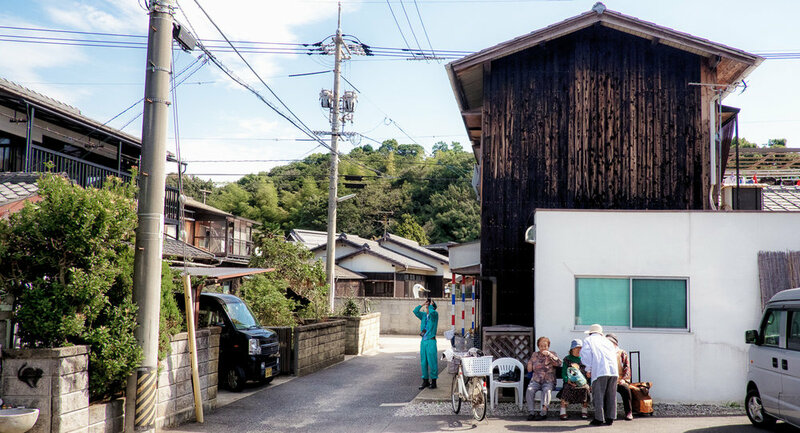 Tadao Ando had a huge impact on this island, designing Bennese House and many other sights around the island (including the bike garage). He has a small museum dedicated to his work. A beautiful, Tadao Ando designed gallery. They have a fancy restaurant in which we didn't eat. Accomodation is also available at Benesse House, which is the only way to get access to the amazing oval building. Sadly, we didn't spring for it. Sold out when we were there... I'd advise buying tickets in advance to avoid disappointment. Also designed by Tadao Ando. This was a fantastic way to explore the village. 7 small exhibits spread across unused houses and a shrine. You can buy a ticket for entry to all exhibits (barring Kinza, which tickets must be bought separately and in advance) for Y1,030 at the Honmura Lounge. We didn't make it, but it is stunning from the outside, and if you feel like bathing underneath a statue of an elephant, this is the place for you. Spread across the island are a range of sculpture and other art sites, including Yayoi Kasuma's pumpkins. If you stay near Benesse House (ie. at the yurts), you can get in before the crowds. But even when crowds are there, people line up patiently to let everyone get the photo that everyone else takes. If you are going to splurge, you can't go past Benesse house. We however were absolutely stoked with our decision to stay at the Naoshima Tsutsujio Lodge, one night in a beachside yurt, the other in a cottage with Tatami sleeping matts. Both were amazing, the benefit of the cottage is the in-room toilet and shower. Yurt sleepers get access to communal facilities, but they are nice enough and you get to sleep in a tent by the water. I loved it. I'd steer clear of the breakfast, especially the western one. Again, if money isn't an issue, I'm sure the restaurant at Benesse is amazing. If you are staying at Tsutsujio, they have a restaurant that smelled great at dinner time... but you have to book in advance as they only order enough food to feed the bookings. Instead, we wandered through the dark until we stumbled into Okonomiyaki Umikko. A quaint, homestyle teppenyaki place with delicious okonomiyaki. Sure, it probably won't win any awards, but we loved it so much we went back on our second night. With grills at the table you can cook up your pancake yourself, and a great local crowd. The soccer was on when we were there so we joined with the Japanese locals cheering against Australia. Café Konichiwa was a nice spot to stop for a drink and from what I hear, a feed. Little Plum was good for a quick feed when we got off the ferry at Miyanoura. And if you have more time, the surrounding islands are supposed to be fantastic too... with art displays of their own and probably far less visitors.